The ballpark is about a 15-20 minute drive from the airport. There are Hampton Inn-type places at the exit from the highway for the ballpark, which are about a mile from the ballpark, but there's nothing to do in that area. There are also hotels in downtown WPB next to the City Walk area, which is about 10 minutes by car from the ballpark. Good to know since I don't drive - think I'll stick to Charlie and Dave for the Grapefruit League season. We had no problem using Uber and Lyft between the hotel (the aforementioned Hampton Inn) and the ballpark. Never waited more than about 5 minutes for pickup and the fares were pretty low. You could probably stay closer to City Walk and still uber/lyft back and forth with no problems. Since most games were day games, we didn't feel pressed to find a lot of other stuff to do--- get some dinner (or have it delivered) and enjoy mindless TV and air conditioning. For road games, there is a Marriott Courtyard right across the street from Roger Dean Stadium in Jupiter where the Marlins and Cards play. Bring cash since some of the stadium vendors don't take card and the single ATM is always broken. It's a fair bit harder to get around Port St Lucie (Mets) without a car; Lyft/Uber and traditional taxi coverage is fairly light and the nearest hotel to the ballpark is about 30 minutes walking in the Florida roasting sun. Not looking promising - would love to check out Nats spring training (having caught many such matches on the radio it sounds like a great way to ease into the season) but Europe is oh-so-much cheaper, safer and more accessible. There aren't usually roaming taxis like you'd see in a bigger city but you can call for dispatch service. Reliability can depend on the company; hotel front desk should be able to recommend a good one. Our hotel in Port St Lucie had a deal with a local car service that they offered without being asked (we declined since we had a local friend to chauffeur us around). Central Florida in March is East England since airfares/hotels are cheaper (kids still in school) and weather is better. As frustrating as another early playoff exit is, let's be thankful baseball will be back next year. 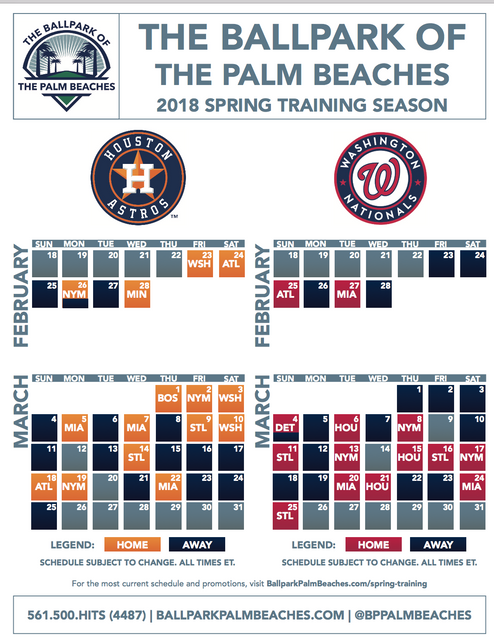 Looks like the Nationals (and the Astros) home spring schedule has been released. Get those travel arrangements ready. Nats are the "road team" on 2/23 to open the Spring against Houston. We are just 121 days until then! Anyone know if Arizona Fall League games will be televised on the MLB network or if i can get the games online somehow? I’m not having much success in my research. Sorry for hijacking your thread with just the second post. Any recommendations on hotels? We stayed at the Hampton Inn about 10 minutes from the ballpark and it was a nice, comfy hotel but the neighborhood was pretty lame, not a lot of dining/drinking options nearby. I hear there’s a “downtown” ish area in West Palm that at least has some little shops and bars but when I look stuff up, it all seems meh. We'll be there the 11th-17th. Well, in Florida. We'll be in West Palm 15th-17th. Woot! We stayed at the Hilton Garden Inn on Kyoto Gardens Drive - It was about a 15 minute drive from the hotel to the ballpark, although while we were down there, President Trump came for the weekend and the direct route to the ballpark was canceled and we had to take a long way. It was nice, City Place is the big thing around there, shops, restaurants, bars, etc. - It's fine, but I come from Buffalo, where the bar scene is like no other. I never went to Vierra, but have to imagine WPB is better? Do they have long neck geese around the ballpark? I'm guessing you could find green alligators. We'll be there. Those emerald green trimmed unis are great looking. Agreed. We will still spend half of our week in Cocoa Beach.